After graduating from The Royal Military College of Canada, Bob enjoyed a long career as an Aerospace Engineer in the Canadian Armed Forces and later as an Information Systems Engineer. Bob always knew he had an artistic streak waiting to immerge. This artistic need first materialized when Bob started painting landscapes in oil. Several years ago oil painting was quickly overcome as Bob's artistic outlet and passion as he discovered the art of woodcarving. Bob immersed himself in woodcarving by taking classes from master woodcarvers like Dave Disselbrett, Jeff Harness, Jerry Harris, and others. Bob now carves with members of the Capitol Woodcarvers Club and The Oregon Decoy and Wildfowl Guild located in Salem Oregon. He participates in several weekly carving sessions with talented carvers where he continues learning his art from the very best. 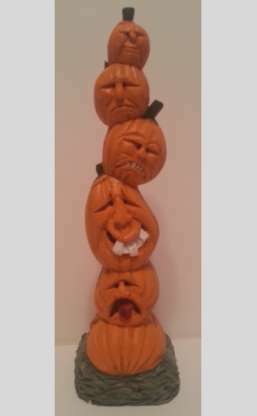 Bob's carving focuses on wood spirits, caricatures, decoys, and fish. 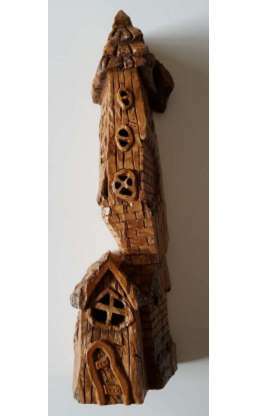 Most of Bob's carving is done with hand tools but recently he has experimented with power carving. Bob displays his award winning carvings at club and artist guild shows as well as at state and county fairs. Bob carves primarily in basswood (caricatures), cottonwood bark (wood spirits and fantasy houses), cedar and tupelo (decoys and wildfowl). Bob suggests that all woodcarvers, or prospective woodcarvers, seek out a local woodcarving club. These clubs typically have members who are very knowledgeable with respect to woodcarving and most are eager to help other beginner or experienced woodcarvers. The Wood Spirit has always been a symbol of good luck and good fortune to those he travels with on the path of life. Nobody knows when the Wood Spirit Legend began because it was near the beginning of time but the old ones believe it began right here in the Great Northwest Forest. Some however, claim it started in Europe where it is called Green Man, Wildman, Savage Man, or Woodwose. The ancient legends of the Wood Spirit continued to emerge with each new generation of Storyteller. Most of the people in tribal groups and cultures of the world used to believe in Wood Spirits in one form or another. Many still do. The people believed they lived in the trees that nourish life in the wilderness. The Wood Spirit was said to be Lord of the Forest and Natural Things. Seeing one was quite a lucky thing, and European villagers used to go out on regular hunts, hoping to find a Wood Spirit to foretell the future of their village. It was said that the forest would stand for as long as the Wood Spirit remained to keep order. And if you were lucky enough to see a Wood Spirit, health, happiness, and good fortune would be yours. However, that did not happen often. Wood Spirits would rather see than be seen. Most sightings were by children or by the pure of heart. Wood Spirits were carved to bring luck to a household, ward off undesirable spirits and keep the household safe. It was believed that any house that was home to a Wood Spirit would stand protected and be blessed with good luck, health and happiness. 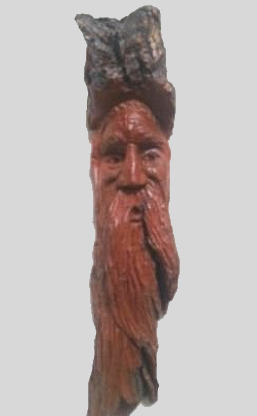 The Valley Woodcarver was created by Bob Curtis to provide an umbrella under which woodcarvers could meet, display their works, exchange ideas, and get assistance. It is Bob's hope that woodcarving will become more widely accepted as an art form and the works of very creative carvers will become better known and appeciated. 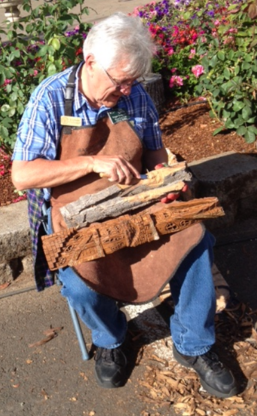 Bob is a proud member of the Capitol Woodcarvers Club located in Salem Oregon. This club is very active with well over 100 members at any time. Please visit the club's web site at capitolwoodcarvers.org, and if you are ever in the Salem area drop in, we will be happy to see you. Please email us at the link below for information and details if you are a wood artist and would like to be featured by The Valley Woodcarver.